In June 1947, brothers Sergio and Vinicio Chiesa, two jugglers briefly at liberty from Ringling Brothers Barnum & Bailey Circus, attended the gathering of jugglers at the International Brotherhood of Magicians in Pittsburgh, Pa. They were guests of Pittsburgh-based juggler Bobby Jule (Joe Pegnato). The brothers impressed attendees with their passing routines and mastery of the 9-ring cascade. 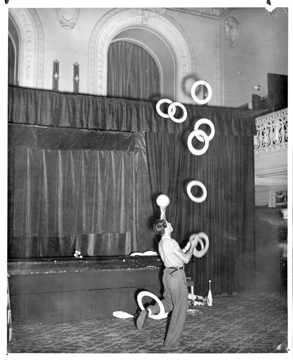 In this photo, Vinicio is shown juggling eight rings while balancing a ball on a head pedestal and spinning a ring on his left leg. Vinicio Chiesa went on to win the Rastelli Trophy in 1965. Date/Location: June 17, 1947; International Brotherhood of Magicians Convention at the William Penn Hotel, Pittsburgh, Pa.